A UK movies fan has to subscribe to 27 services to get a full catalog of current(ish) releases. On the 27th Sept, Torrentfeak comments on an MPAA funded report on film distribution in the USA. It highlights the oddity that the most used service (Netflix) has the weakest catalogue. Later in the year, the researcher, KPMG LLP published a report on the UK market, and locally hosted here … which Torrentfreak commented on here…. The headline was that a film fan wanting the best catalogue would need to subscribe to 27 services, which seems a bit excessive. (How right is this? Is it just SVOD that’s weak, what does it say about EST vs SVOD? What’s the obvious vertical integration strategies? What insight does Tim Wu’s master switch have to offer? These stats are admittedly a fairly impressive read, but the details take off some the shine. Accessing content online should be a relatively painless affair, but UK film fans are going to need quite a lot of patience if they want the broadest possible choice. In fact, in order to access content at the levels detailed above, users will need to use to more than two dozen services, 27 to be precise. 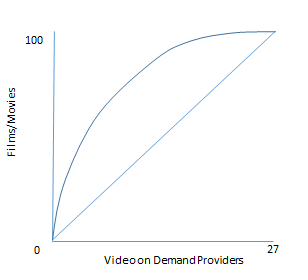 available via online video on demand distribution on at least one of the 27 service offerings studied,” the report reads. When the researchers required that titles must be found on 5 out of 27 services, overall availability drops to 73%, meaning that more than a quarter of popular content is missing, even for consumers with five separate online movie accounts. I was interested in drawing a pareto chart showing how one approached a reasonable coverage. The data is not published in a way that makes this easy, so I have made a sketch. The KPMG report and the Torrentfreak article both make it clear that Netflix and it’s smaller Subscription Video on Demand competitors have supply chain difficulties and it’s obviously a cause of Netflix’s decision to make its own. The researchers argue that the Netflix UK catalogue is better than that in the US, which seems odd and to conflict with the evidence that examining the Sky/Netflix competitive nexus provides.